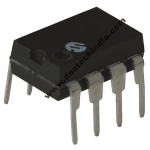 Microchip technology MCP3201 ADC is a successive approximation 12-bit analog-to-digital(A/D) converter with on-board sample and hold circuitry. The device provides a single pseudo-differential input. Differential Nonlinearity (DNL) is specified at ±1 LSB, and Integral Nonlinearity (INL) is offered in ±1 LSB (MCP3201-B) and ±2 LSB (MCP3201-C) version, Communication with the device is done using a simple serial interface compatible with the SPI protocol. The device is capableof sample rates of up to 100 ksps at a clock rate of 16MHz. The MCP3201 device operates over a broad voltage range(2.7-5.5V). Low-current design permits operation with typical standby and active currents of only 500nA and 300uA, respectively.